The Concert "with the poor and for the poor" was held in the Paul VI Hall on Thursday 14th of May at 6:00pm. Therefore, our project of faith and charity was carried out to support the accomplishments the Holy Father achieves through the Apostolic Alms. To our great astonishment, the announcement of this concert had a very wide media resonance, as the most illustrious guests, those who occupied the most important places, were our poor, the sick and the needy, who asked to the Volunteer Associations that assist them ,to be able to participate in person. 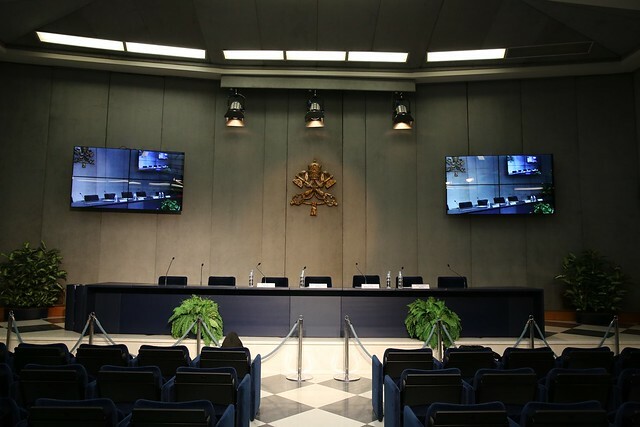 This attention from the public and the media was also reflected in the desire of TV2000 (the television broadcaster of the Italian Episcopal Conference) to record the event in order to be able to broadcast it within their schedule. Together with us on our journey, was the Philarmonic Orcherstra of Salerno directed by Maestro Daniel Oren, one of the greatest Directors on the international scene, who wanted to honor us with his presence. Equally significant was the participation of solo singers belonging to the Italian music scene, who demonstrated sensitiveness and commitment to this initiative in donating their artistic talent. Next to them, the Choir of the Diocese of Rome, founded by Mons. Marco Frisina, who for over thirty years has offered his service to the Diocese and his Bishop the Pope. As wished by the Holy Father during the Private Audience granted to the Supporters and the Organizers the very morning before the event, "music had the ability to unite souls". Also during the audience, the Pope thanked everyone for the good work, hoping that the evening would become "a Concert to sow joy, not a amusing joy of a moment, but the seed will remain there in the souls of everyone and will do so much good to all ", which - we can affirm - has fully materialized. More than 8,000 people were present in the Paul VI Hall. Among these, the almsgiver of His Holiness, S.E. Archbishop Konrad Krajewski, and over 2,500 among the poor, the sick and the refugees all seated at places of honor and who were offered a meal at the end of the evening. Amongst them, one could feel a profound gratitude and a strong emotion. Over 150 migrants and refugees were present through the Astalli Center. 40 prisoners from the Rebibbia Prison intervened, who obtained a special permit to participate in this evening. Likewise the Grand Priory of Rome and the Delegation of Rome of the Sovereign Military Order of Malta, the Circolo S. Pietro, the Diocesan Caritas, UNITALSI and the ACLI of Rome have accompanied small inhabitants of the Family Houses, Roma boys, sick and disabled, guests of their Center for the Elderly, Centers for Life Aid. The Daughters of Charity Sisters took part in the event together with those who- citing their founder - they are defined as "the last of the last" and the many homeless, single mothers with their children and those sick with AIDS. Finally, the participation of Roman Parishes with young people, schools and families was very great, in particular those who live in situations of great discomfort in the suburbs of our city. To celebrate the 750th anniversary of Dante's birth, evoked many times by the Popes in their writings and in their speeches, we began by listening to the verses of the Divine Comedy, which for the first time, resounded in music in the Hall. The second part of the Concert saw, instead, the performance of passages dedicated to Easter Time: to its joy and to its hope. As expected, the entire amount of the offering received by the audience, together with the generous donations of the Supporters, were delivered directly into the hands of the Apostolic Almer. Pia de' Tolomei Ricordati di me. Verso il Paradiso L'amore di colui che tutto move.